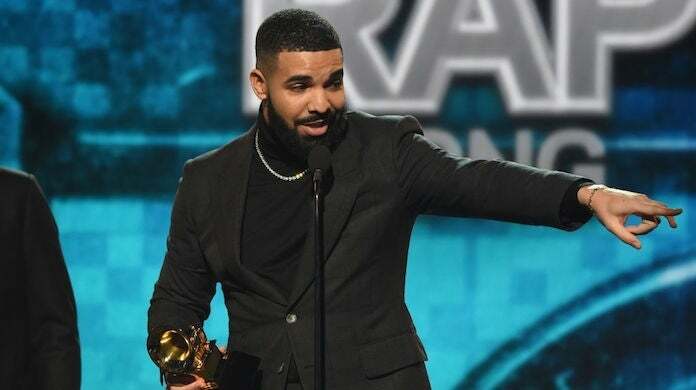 After fans reacted to Drake's acceptance speech for Best Rap Song during Sunday night's Grammy Awards, the Recording Academy clarified that producers did not intentionally cut to a commercial break in the middle of the rapper's speech. The 32-year-old "God's Plan" rapper was in the middle of a speech throwing some mild shade at the very idea of awards shows when producers cut to a commercial. He sounded like he was not about to let past perceived award show snubs go without mention, calling his award "the first time in Grammy history where I actually am who I thought I was for a second, so I like that." At that point, the show cut away to commercial, much to social media's dismay. "But..." Drake could be heard saying before the broadcast cut him off. "How are you going to cut @Drake off at the #Grammys2019," one Twitter user wrote. "They cut off @Drake's speech at the #grammys2019 for being real ? That's some shady s—..." another wrote. "So y'all got cut Drake off cuz he said he don't need ya stinkin trophy?!" someone else said. "God's Plan" was also nominated for Record of the Year and Song of the Year, with Drake's Scorpion nominated for Album of the Year. "Nice for What" was nominated for Best Rap Performance.